Nobody Owens, known to his friends as Bod, is a normal boy. He would be completely normal if he didn’t live in a sprawling graveyard, being raised and educated by ghosts, with a solitary guardian who belongs to neither the world of the living nor of the dead. There are dangers and adventures in the graveyard for a boy – an ancient indigo man, a gateway to abandoned city of ghouls, the strange and terrible fleer. But if Bod leaves the graveyard, then he will be in danger from the man Jack – who has already killed Bod’s family . . . Even as a child, I’ve always been obsessed with ghosts and cemeteries, and despite the fact that I would have been terrified, I remember having this idea that it would have been so cool(!) to just move my whole family to a graveyard and live surrounded by spirits and ghouls and whatever other sort of lovely non-living things one might find therein. Since that obviously never quite worked out for me as a child, it only makes sense that I would eventually pick up The Graveyard Book to live vicariously through Nobody Owens. I’ve struggled with Gaiman’s work in the past, but this was my first time trying out his middle grade work or an audiobook format of one of his stories, and I’m not sure which of those details (or maybe both!) contributed to the outcome, but it was incredible. I absolutely could not get enough. I didn’t have any errands to run to justify car-listening like I usually do, so I literally talked myself into cleaning just so I had a good excuse to listen to this book. That never happens. First, Neil Gaiman’s writing is absolutely stunning. I actually find The Graveyard Book a little hard to categorize strictly as middle grade, because I think readers of any and all age ranges could easily enjoy this book. It makes it even more interesting that we get to watch Bod grow up throughout the book, going from a toddler to a young man, with adventures occurring every so often throughout his childhood. We zoom in on these adventures, but Gaiman’s writing has a way of making it feel like you never missed a beat, despite there often being years spanning between chapters. Bod is a really enjoyable protagonist, but for me, the shining stars were the side characters—namely Silas, Bod’s mysterious, secretive mentor, but also Miss Lupescu and Liza Hempstock, both of whom I would have loved to see even more of. The only problem with the time jumps between chapters is that we rarely get to see the same character two chapters in a row, with the exception of Bod and Silas, but Miss Lupescu’s chapter was quite possibly my favorite in the entire book. Of course, Gaiman isn’t known for writing particularly happy books, and there are some surprisingly tragic themes to the story—from the very beginning, in which we hear that Bod’s entire family has been murdered, all the way to the painful but necessary ending that had me choking back tears of both sorrow and indignation (how dare you, Mr. Gaiman?!) That said, it’s the sort of sadness that won’t be too much for children, and I dare say, I think would hit an adult or teen reader much harder than it would a child in the “intended” readers’ age range. Despite those heavier moments, it’s also full of light and smiles (and thinly veiled sighs of relief as Bod is saved from yet another disaster he’s landed himself in). 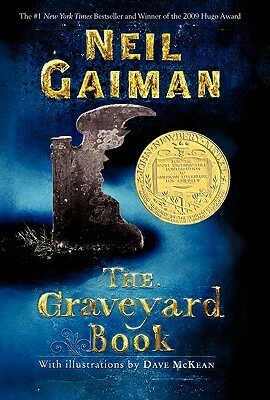 The Graveyard Book was so lovable that it’s completely changed my mind on Gaiman as an author, and has convinced me that I absolutely must give his adult books another try, because I loved every moment of this spooky little read and could happily see myself picking it up again and again in the future. Thank you! I’m so glad we both loved it. This is definitely one I’ll be recommending to everyone for a long time to come! I read this quite awhile ago and enjoyed it very mush. The storytelling is rich and has a depth I treasure in reading. I just finished another middle grade book City of Ghosts and this one also has amazing storytelling. Agreed, the storytelling is lovely! Ohh, I adored City of Ghosts, too! I’m so glad you loved it. I feel like it is getting some very unfairly mixed reviews from readers who are used to Schwab’s usual YA and adult writing styles, but as a lover of MG horror, I thought City of Ghosts was beautifully executed! Awesome review! One of my best friends is a huge Gaiman fan and loves this book 🙂 this is next on my list of his books. Thank you! 😀 Oh, I hope you like it!! I really recommend the full cast audio if it’s an option. The guy who voices one of the very minor characters, Mr. Owens, sounds JUST LIKE Brendan Gleeson, the guy who played Mad-Eye Moody haha! I keep swearing it IS him but I cannot find credits for that character anywhere because he only has 3-4 short lines. Aye, matey! This book be wonderful. Just wanted to say that ye should listen to Mr. Gaiman read fortunately, the milk because it is not just for kids. And any and all other audiobooks wherein he reads his own stories. So very good. I am working me way through rereading them all in audiobook format. Just me two cents. Arrr! Oooooh, I totally will! I’ve never tried any of his self-narrated audiobooks but I watched a youtube video a few years ago of him reading children’s stories and his voice was so nice that I can see how listening to him read his own books would be an incredible experience. Thank you for the tips! I’m so happy you enjoyed this one Destiny! The ending got me teary eyed too! It was soooo sad and bittersweet! Like, on the one hand, yaaaaay adventure, but on the other hand, NOOOOO lol! Oooh, if you do give it another try, I really recommend the audiobook! 😀 It was so lovely! Thank you ♥ I hope you like it more next time, if you try it again! This is a great review! I’ve had this book on my shelf for ages but have yet to pick it up. I’ve actually never not listened to a Neil Gaiman audiobook, and because he narrates them himself, they’re often my favourite. Thank you! It’s so excellent. Oooh, awesome—is there a particular one from his adult library that you recommend picking up first?